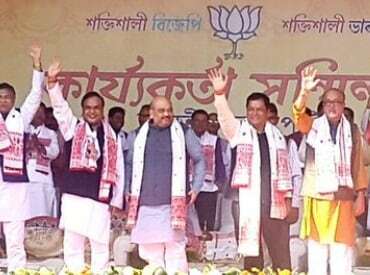 The Bharatiya Janata Party (BJP) sounded poll bugle in Assam today with party president Amit Shah holding a well-attended party workers’ rally in Dibrugarh in Upper Assam. With the assembly polls due in the state in around April next year, political parties are upping the ante in the state. The BJP, which had displayed spectacular performance in 2014 general election by winning seven of the 14 Lok Sabha seats in the state, is hoping for a repeat of the performance again in 2016. The party is hopeful of forming the next government in Assam and knows that for this to happen, Upper Assam holds the key. If the party can sweep Upper Assam, as it did in 2014, chances are it would emerge as a frontrunner for staking claim in Dispur. Dibrugarh Lok Sahba constituency in Upper Assam, the venue for today’s rally, had been a stronghold of the Congress party till the BJP snatched it in 2014 where party candidate Rameshwar Teli defeated veteran Congressman Paban Singh Ghatowar amidst ‘Modi wave’. The party choosing Dibrugarh as today’s venue was probably aimed at further consolidating its base in the Congress’ stronghold. In preparation for the polls, BJP had few days back made a major change in its state leadership. It brought back Sarbananda Sonwal as state president, replacing incumbent Siddhartha Bhattacharjee. It was under Sonwal’s leadership that the party fought the 2014 election in Assam. The move too is seen as a strategic one by the party to garner votes in Upper Assam, as Sonwal has good following the area. “Assam will be the first state in eastern India where the BJP will form the government,” said a confident Amit Shah while addressing the rally. He also charged the ruling Congress party of holding closed door talks with All India United Democratic Front (AIUDF), headed by cleric Maulana Badaruddin Ajmal, for a pre-poll understanding. “Why is the Congress holding closed door talks with AIUDF? If it has courage, let it hold talks in open. Both Congress and AIUDF have secret plans to make Assam an extended part of Bangladesh,” said Shah. Following the victory of ‘Mahagathbandhan’ of JD(U) and RJD in Bihar, Assam chief minister Tarun Gogoi floated the idea of ‘Maha-understanding’ among ‘secular forces’ to defeat the BJP in the upcoming poll. The Congress for the first time is facing a tough challenge from BJP in Assam, particularly in Upper Assam constituencies. The Congress had a dismal performance in 2014, where it could just manage to win three Lok Sahba seats. However, its idea of ‘Maha-understanding’ is yet to take any shape on the ground in the desired way as political parties like the Asom Gana Parishad (AGP) and Bodoland People’s Front (BPF) and AIUDF haven’t reciprocated well to Gogoi’s idea. The Congress party today, on the other hand, led a protest rally to Raj Bhavan in Guwahati, seeking Governor PB Acharya’s removal for a recent controversial remark. The Governor recently said that “Hindustan is for Hindus” and state chief minister said he was acting more like a Rastriya Swayamsevak Sangh’s (RSS) agent and demanded his recall.